Alain Burrese’s passion for the martial arts started in the 1970s when he took home Fred Neff and Bruce Tegner books from the local library. In 1982, while in high school, he took his first formal martial art classes when he trained and competed in Judo. After high school, Alain served as a paratrooper with the 82nd Airborne Division and a sniper instructor for the 2nd Infantry Division in South Korea. He then went to college to earn his B.S. degree in business, and then lived in Japan. During these years he studied a variety of martial arts, including Karate, Taekwondo, and Hapkido, but due to moving frequently, he never tested for a dan grade in any of them. He also trained with self-defense author Marc MacYoung when he lived in southern California and worked a bodyguard/security position with him. After writing his first book on self-defense, he decided to pick a martial art to focus his training. He chose Hapkido, from the Billy Jack films, and an art he had studied for a while in 1989-90. He moved back to South Korea to devote himself to Hapkido. While living there, he taught English in the evenings to support himself and attended 11 Hapkido classes and 5 Qigong classes weekly. When he returned to the United States, he earned his J.D. from the University of Montana School of Law. He practiced law for a number of years, but left the practice to pursue his dreams of writing, speaking, and teaching. He continues to return to Korea to train with his instructors, and currently holds a 5th dan from them in Hapkido. Alain is the author of several books, including Survive a Shooting, Hard-Won Wisdom From the School of Hard Knocks, Lost Conscience, and the Tough Guy Wisdom series. 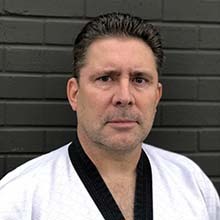 He has starred in eleven instructional DVDs, including Hapkido Cane, Streetfighting Essentials, and the Lock On: Joint Locking Essentials series. He’s also written numerous articles, including articles for Black Belt and Karate/Kung Fu Illustrated. He is currently working on several new book and DVD projects, as well as teaching regularly in Montana and traveling to speak and teach around the country and soon the globe.